Due to the art theme this year, Best Buddies members tie-dye t-shirts at Happy Hollow Park. This year’s Best Buddies kickoff event was a kickball game. Blue skies, sunshine, and warm weather made the event fun for everyone to enjoy. The club pairs special needs students with mainstreamed peers with a mission to champion inclusion and society amongst these diverse groups of individuals. The event was centered on chapter members and buddies, encouraging friendships and getting to know one another. The first part of the evening was spent playing the game itself. Traditional kickball rules were followed in a competitive contest. All of the attendees enjoyed the game. Afterwards, snacks and drinks were served. “I had a really good time getting to know the new members it was a lot of fun and great memories,” said Lucas Mockus, a chapter member of the club. Every year, Best Buddies has a theme that they engage in and focus on throughout the year. 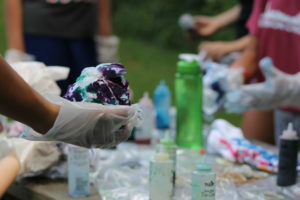 This year, the club’s theme is “Art Buddies.” In light of that, they tie-dyed t-shirts. “Since this year’s theme is art buddies, I really enjoyed tie-dying shirts and everything that has to do with art,” said one of the buddies, senior Hue Koh. From its’ foundation, the club has fostered relationships among students. It continues to do a fantastic job melding peers throughout the different events. Together both the members and the buddies hang-out a few times every month and participate in fundraising activities for the Best Buddies International organization. “I just think it’s a really great club for students trying to make friends, and it’s a nice way to branch out for WLHS students,” said Nico Hoon, an adviser to Best Buddies and Special Education students.